Where might shale gas be found in Great Britain? Great Britain has substantial volumes of shale gas and shale oil resources within Carboniferous and Jurassic-age formations, distributed broadly in its northern, central and southern regions. The Department of Energy and Climate Change (DECC) recently commissioned the British Geological Survey (BGS) to perform three studies of shale gas resources in Great Britain: the Carboniferous Bowland-Hodder shales in central Britain (released in June 2013); the Jurassic shales in the Weald Basin of southeast England (released in May 2014); and the Carboniferous shales of the Midland Valley of Scotland (released in June 2014). The first study comprised the Bowland Shale Formation and its equivalents, together with older shales which are similar to those found in the Hodder Mudstone Formation. The study divided the shale play into the Upper Unit, which is typically up to 500 ft (150 m) thick, and the Lower Unit, which may reach a thickness in excess of 10,000 ft (3,000 m). The latter represents greater potential than the Upper Unit, but also a greater uncertainty of resource estimates because few wells have extended to its depths. The central estimate of the study indicated that there could be 1,300 tcf (37.6 tcm) of natural gas in place (GIP). The lower and upper estimates are 822 tcf (23.3 tcm) and 2,281 tcf (64.6 tcm) respectively. The Jurassic shales in the Weald Basin (Southeast England) present shale oil potential. The lower and upper estimates of oil in place (OIP) are 2.20 billion barrels (bn bbl) (293 million tonnes [Mt]) and 8.57bn bbl (1,143 Mt), but the central estimate for the resource is 4.4bn bbl (591 Mt). No significant gas resource is recognised using the current geological model, primarily because the shale is not thought to have reached the geological maturity required to generate natural gas. 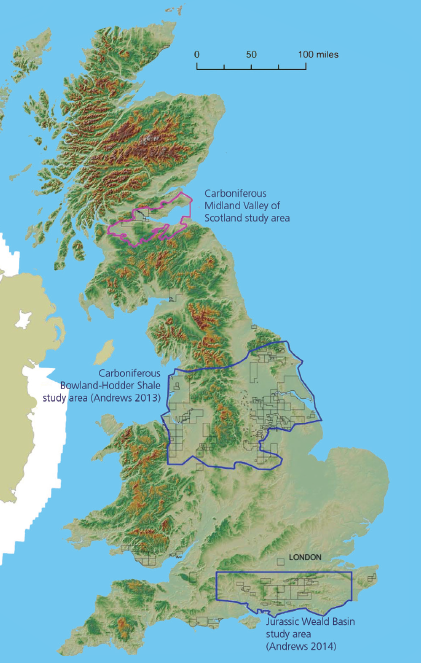 The third BGS study covers the Carboniferous shales of the Midland Valley of Scotland, and suggests a modest amount of shale gas and oil in place. The central estimate of GIP is 80.3 tcf (2.27 tcm), where the lower and upper estimates are 49.4 tcf (1.4 tcm) and 134.6 tcf (3.81 tcm) respectively. The central estimate of OIP is 6bn bbl (793 Mt), where the lower and upper estimates are 3.2bn bbl (421 Mt) and 11.2bn bbl (1,497 Mt) respectively. Due to limited good quality data and complex geology, there is a higher degree of uncertainty with this shale gas and shale oil resource estimation than the previous Bowland-Hodder and Weald Basin studies. For each of the three BGS studies, figures for volumes of natural gas and oil in place represent the total amount of petroleum resources present in the rocks. It is not known what percentage of these resources are technically and economically recoverable. More data from drilling and production rates are needed in order to estimate a recovery factor, as well as more reliable figures for reserves, GIP, and OIP. By way of indication, the Marcellus shale in the US has a typical recovery factor in the range of 20 - 40%. Actual recoverable amounts are dependent on factors such as the specific reservoir geology, access to the reservoir, and gas market prices.